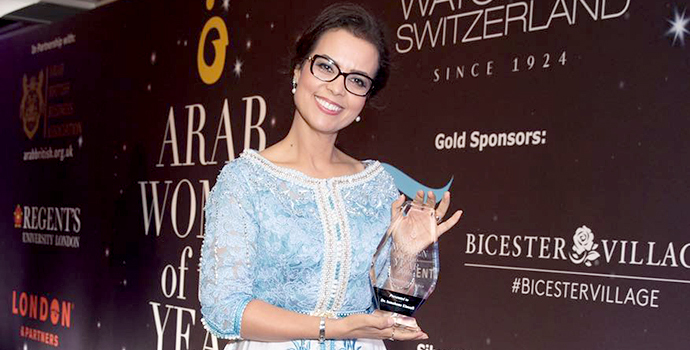 Dr. Ismahane Elouafi, Director General of the International Center for Biosaline Agriculture (ICBA), has won a prestigious Arab Women of the Year 2016 award in recognition of her long-term commitment and contribution to promoting science and innovation, especially among Arab women. She was presented the Achievement in Science Award at a high-profile ceremony in London attended by Gulf royalty, diplomats, British politicians, and prominent business leaders. The award recognizes women who are advocates, visionaries or trailblazers in a science-related field. “We at ICBA also work to empower women in science through different programs like the newly launched Young Arab Women Scientists Leadership (Tamkeen) program,” she added. In August 2016 ICBA launched the design phase of the Tamkeen program. Funded by the Islamic Development Bank (IsDB) and the Bill & Melinda Gates Foundation, the design phase will lay the groundwork for the Tamkeen program, the first of its kind in the Middle East and North Africa (MENA) region. The program aims to improve leadership opportunities, provide peer and mentor relationships, and contribute to the long-term goal of increasing women-led research into improved food security. During the ceremony, awards were also presented to the most outstanding women personalities and entrepreneurs of the year across selected disciplines such as television, cinema, music, sports, and others. The other winners included H.H. Princess Ameerah Al-Taweel (Achievement in Social Leadership); Ms. Salwa Idrissi Akhannouch (Achievement in Business); H.H. Sheikha Souad Al-Sabah (Lifetime Achievement Award); Dr. Nashwa Al Ruwaini (Achievement in Media); Ms. Sawsan Al-Sha’er (Achievement in Community Awareness); H.E. Taghreed Hikmat (Achievement in International Law); Ms. Eman Ayad (TV Presenter Award); Ms. Jannat Aljumily (Achievement in Art); Ms. Muzoon Rakan Almellehan (Young Education Activist); and Ms. Hassiba Boulmerka (Achievement in Sport). A Special Award was also awarded to the late H.E. Ameera Bin Karam (1978-2016). The ceremony was organized by the Arab British Business Association and Regent’s University London.